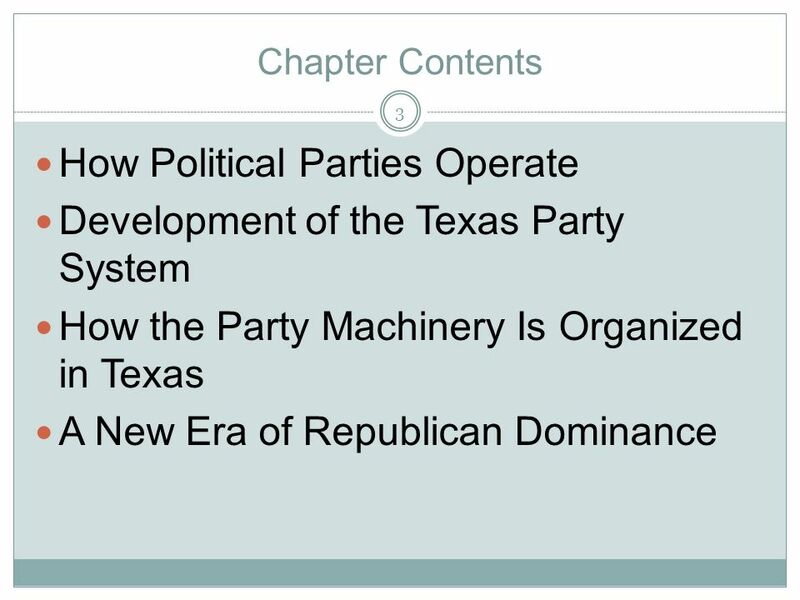 Chapter Nineteen: Political Parties in Texas. 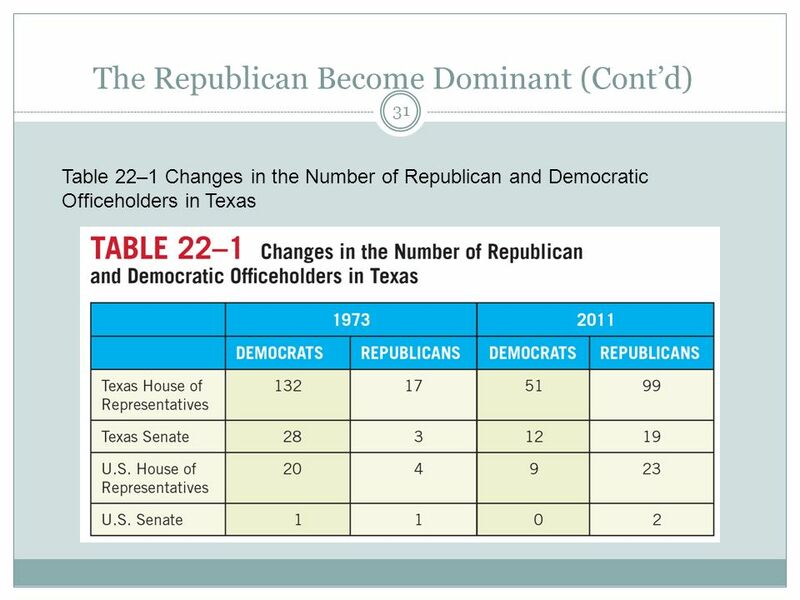 2 Questions to Consider Why was Texas politics dominated by the Democratic Party until the early 1990s? 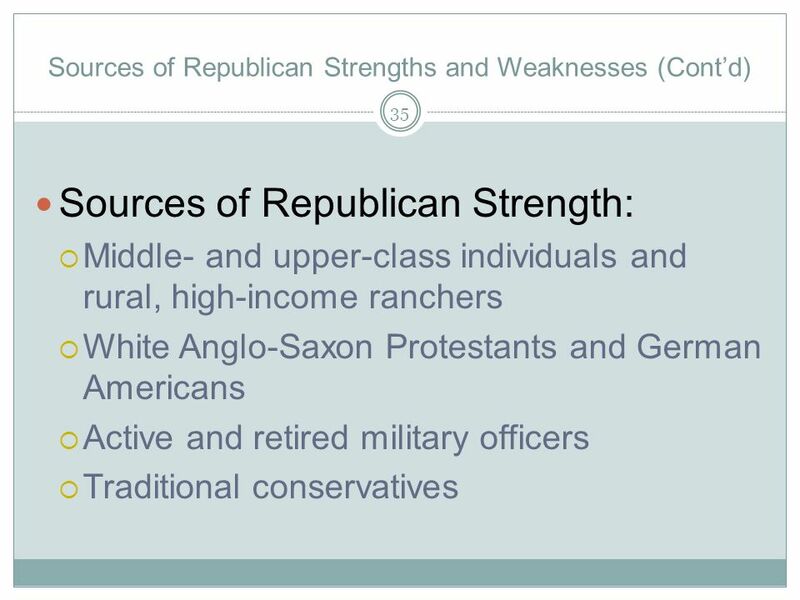 Why have a majority of Texans come to identify with the Republican Party? 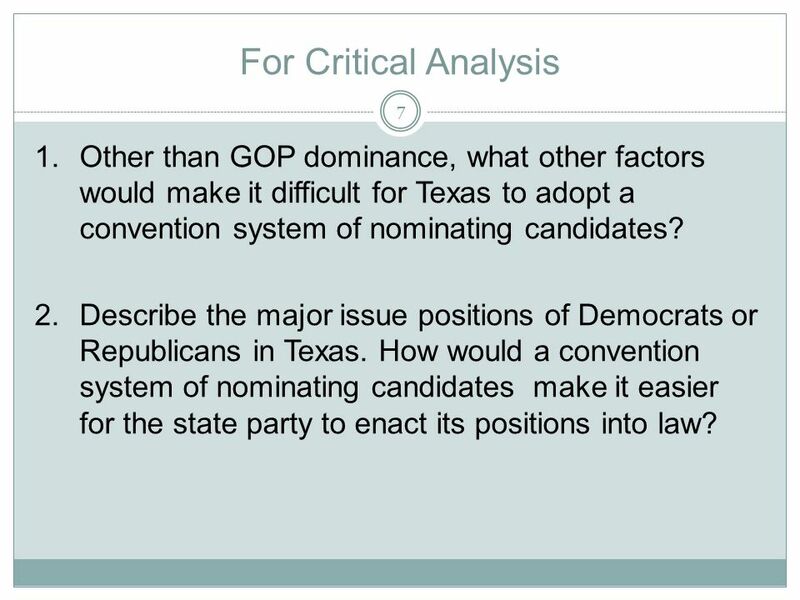 What developments could lead to a resurgence of support for the Texas Democratic Party? 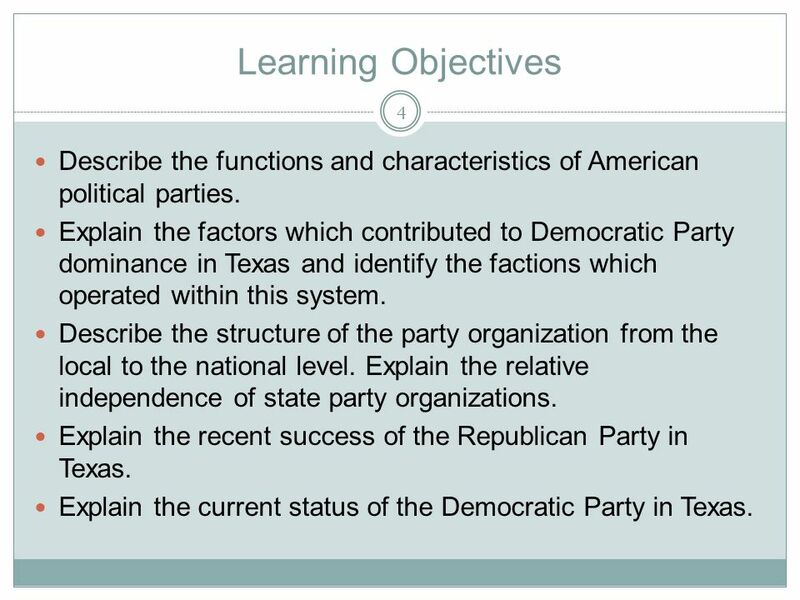 4 Learning Objectives Describe the functions and characteristics of American political parties. 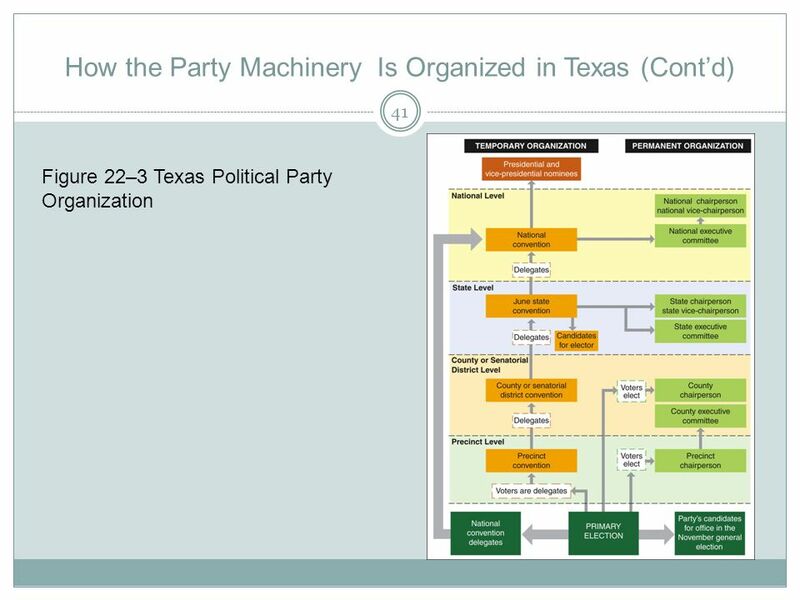 Explain the factors which contributed to Democratic Party dominance in Texas and identify the factions which operated within this system. 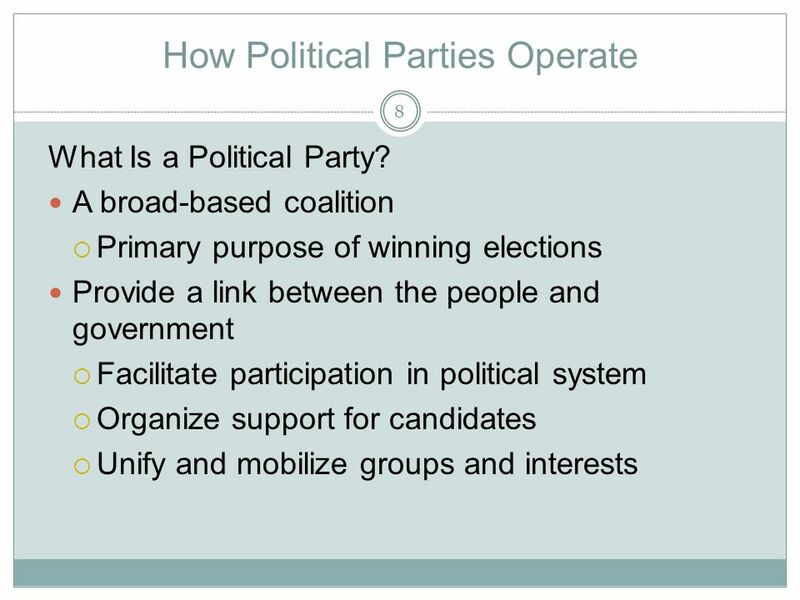 Describe the structure of the party organization from the local to the national level. 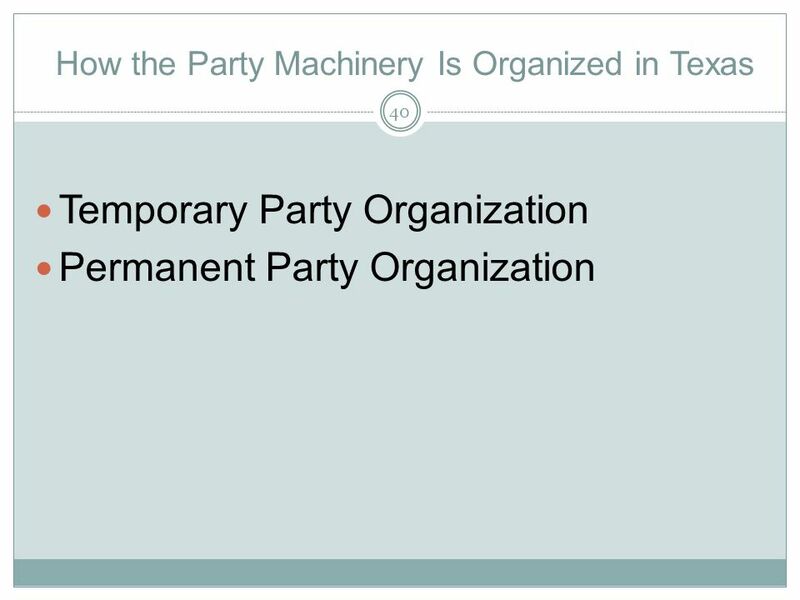 Explain the relative independence of state party organizations. 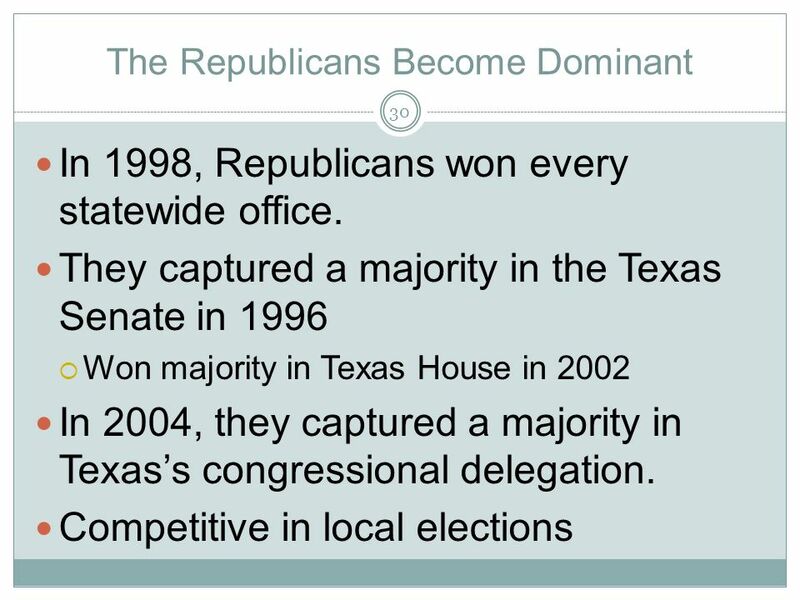 Explain the recent success of the Republican Party in Texas. 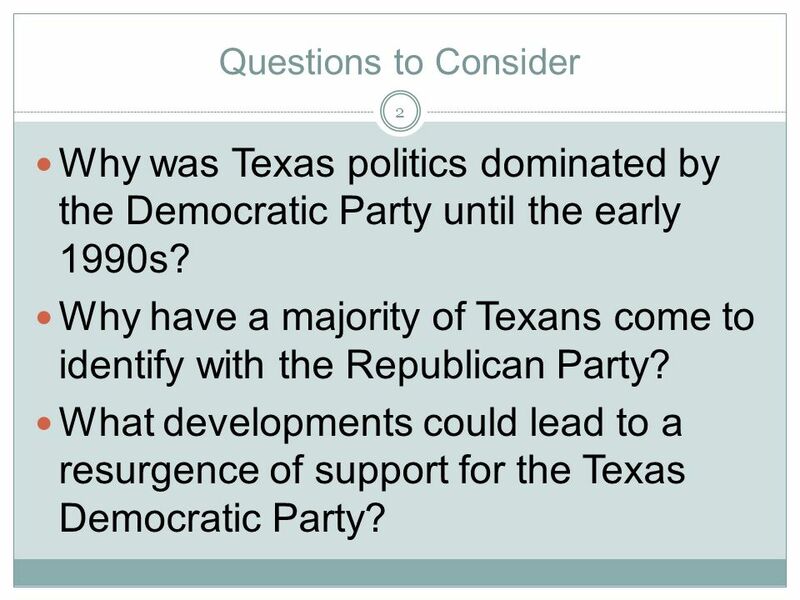 Explain the current status of the Democratic Party in Texas. 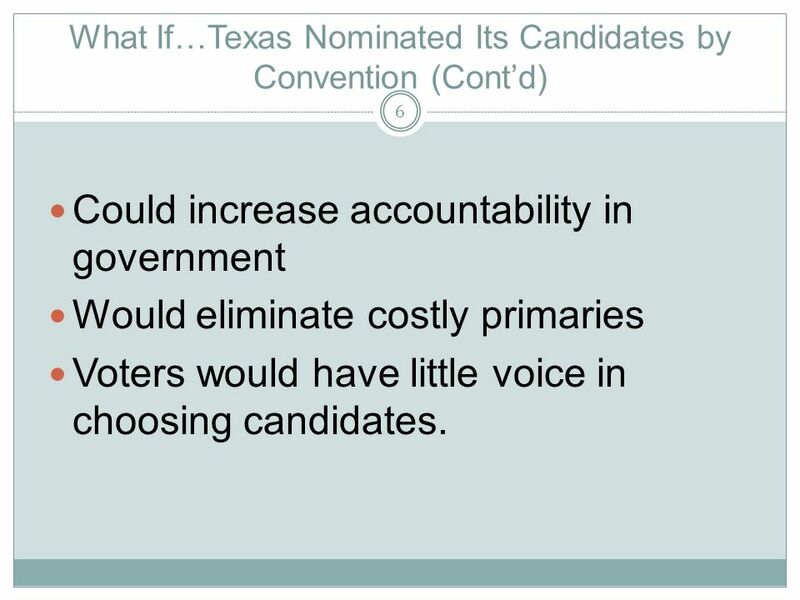 Could increase accountability in government Would eliminate costly primaries Voters would have little voice in choosing candidates. 7 For Critical Analysis 1. 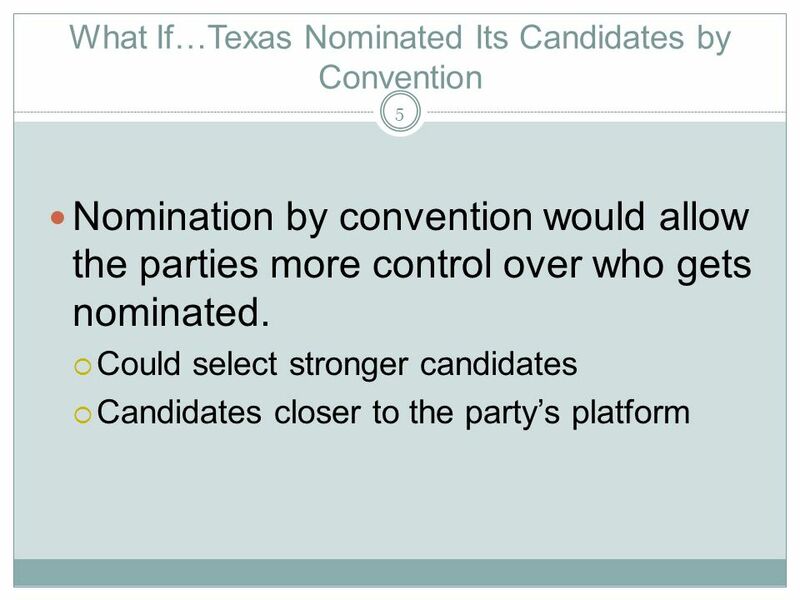 Other than GOP dominance, what other factors would make it difficult for Texas to adopt a convention system of nominating candidates? 2. 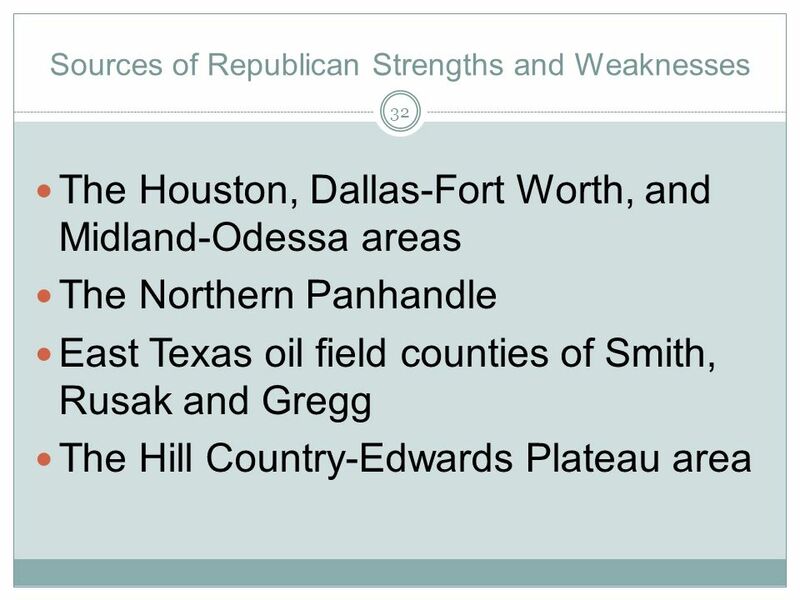 Describe the major issue positions of Democrats or Republicans in Texas. 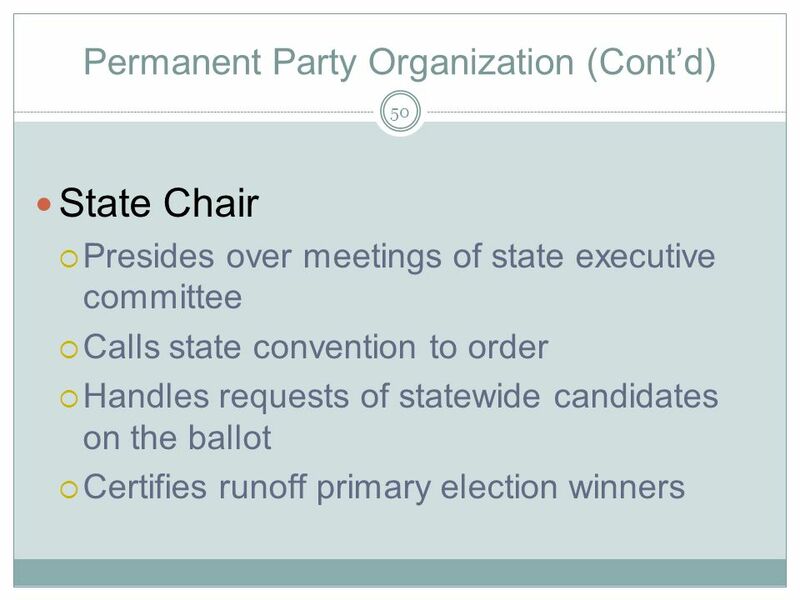 How would a convention system of nominating candidates make it easier for the state party to enact its positions into law? 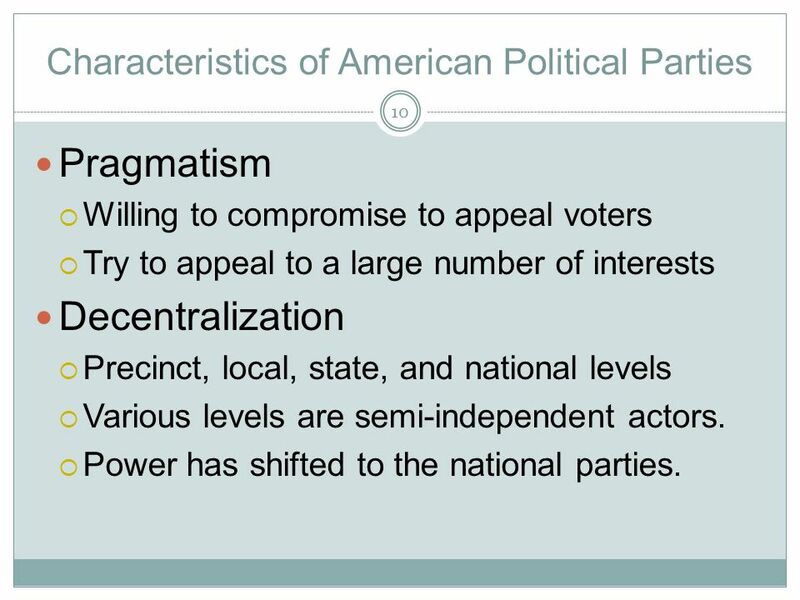 Pragmatism Willing to compromise to appeal voters Try to appeal to a large number of interests Decentralization Precinct, local, state, and national levels Various levels are semi-independent actors. 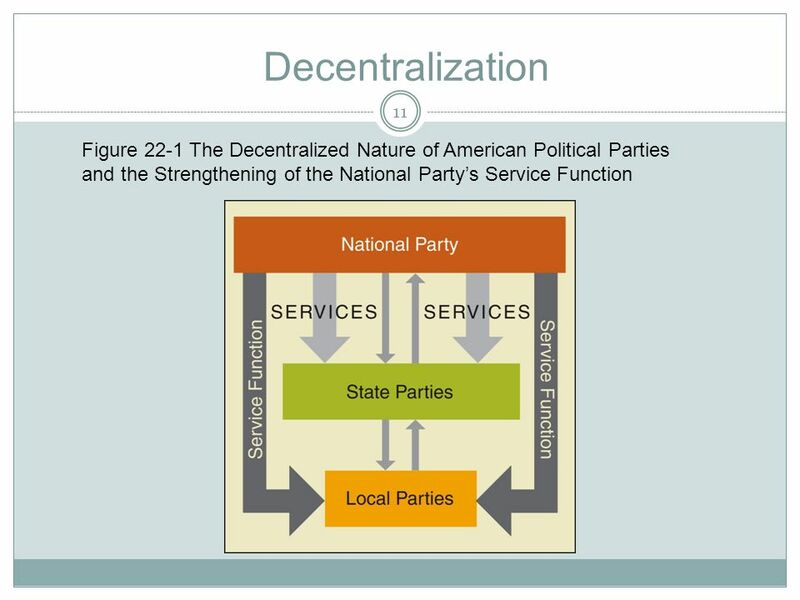 Power has shifted to the national parties. 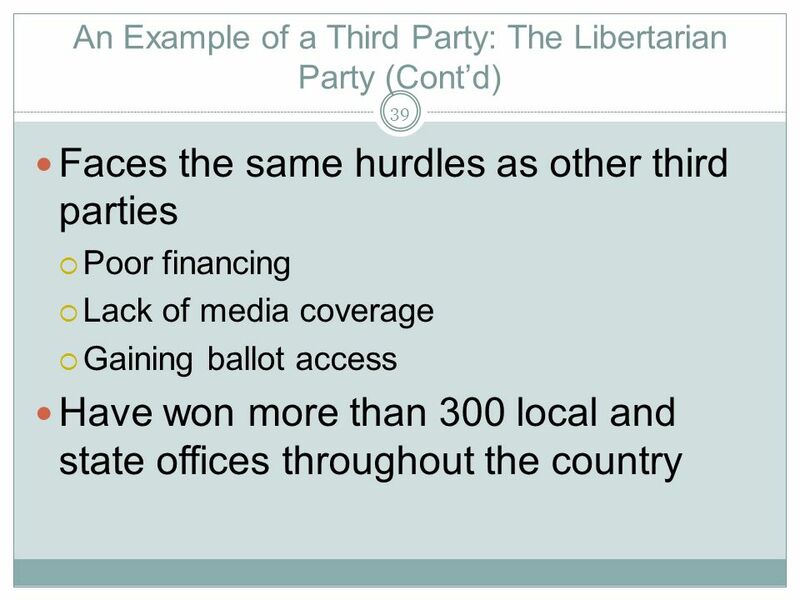 12 Third parties have difficulty winning elections. 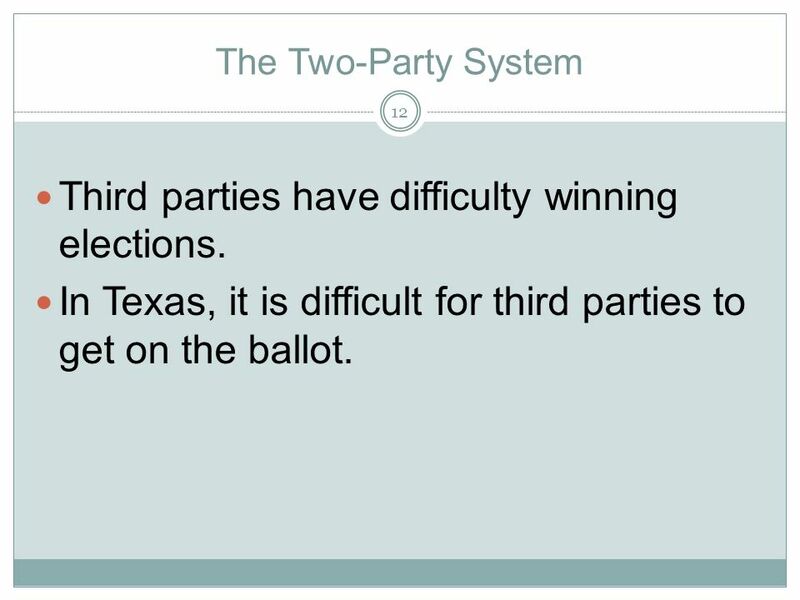 The Two-Party System Third parties have difficulty winning elections. 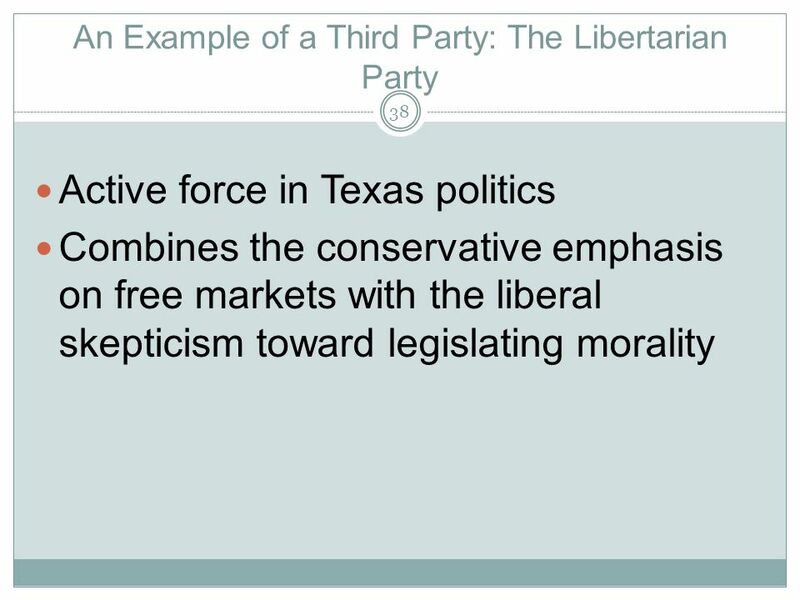 In Texas, it is difficult for third parties to get on the ballot. 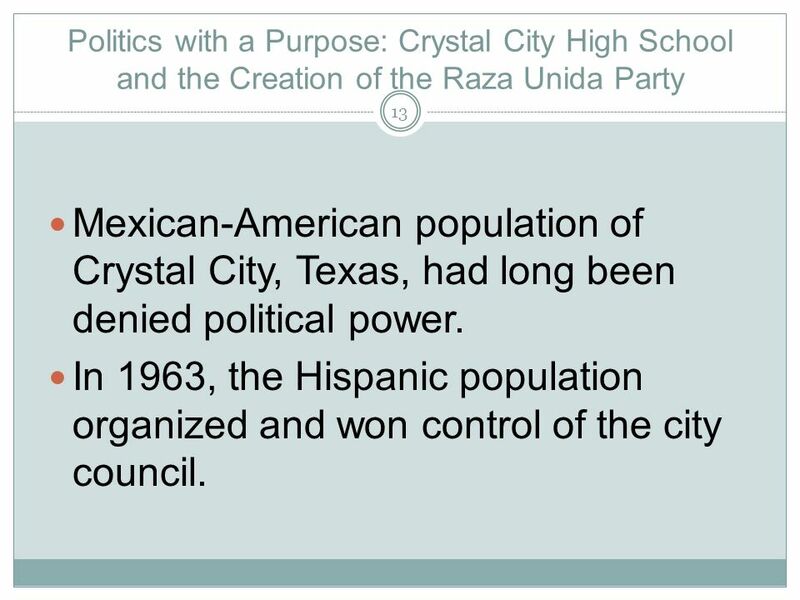 Mexican-American population of Crystal City, Texas, had long been denied political power. In 1963, the Hispanic population organized and won control of the city council. 14 Protests led to the election of Hispanics to the school board. 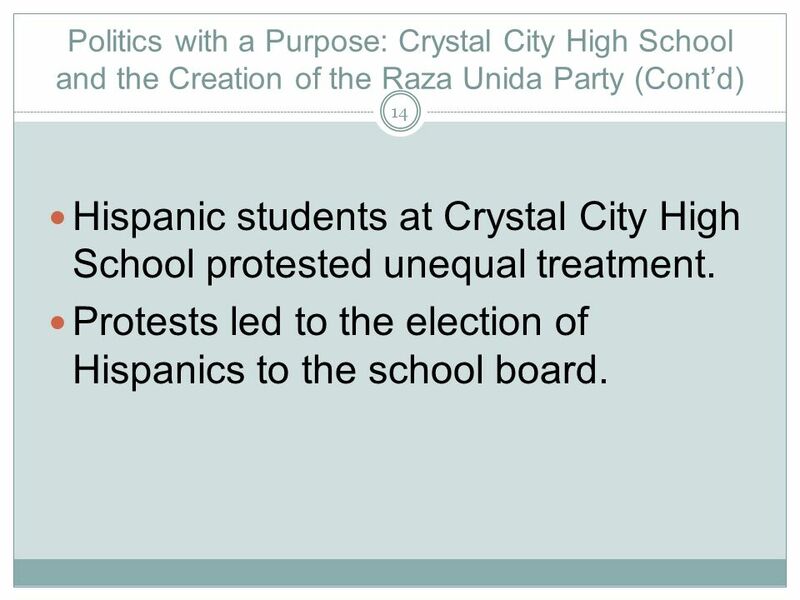 Politics with a Purpose: Crystal City High School and the Creation of the Raza Unida Party (Cont’d) Hispanic students at Crystal City High School protested unequal treatment. Protests led to the election of Hispanics to the school board. 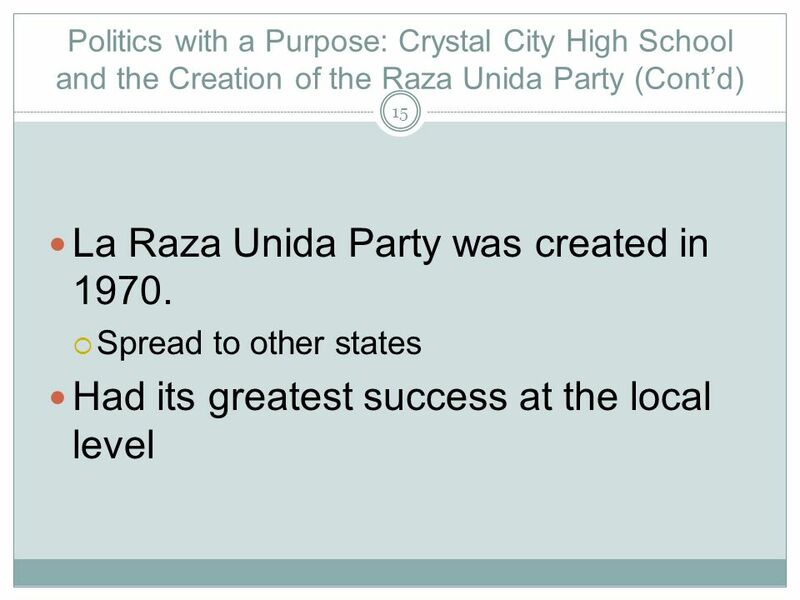 15 La Raza Unida Party was created in 1970. 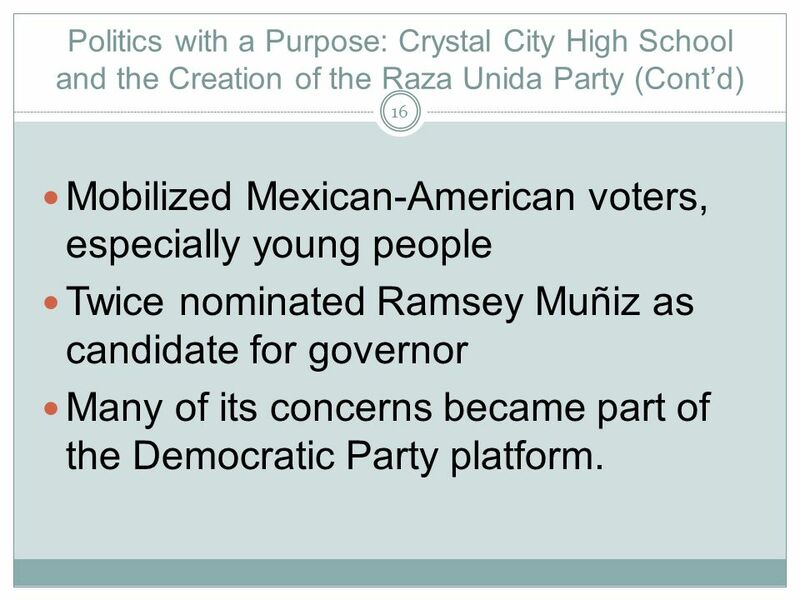 Politics with a Purpose: Crystal City High School and the Creation of the Raza Unida Party (Cont’d) Mobilized Mexican-American voters, especially young people Twice nominated Ramsey Muñiz as candidate for governor Many of its concerns became part of the Democratic Party platform. 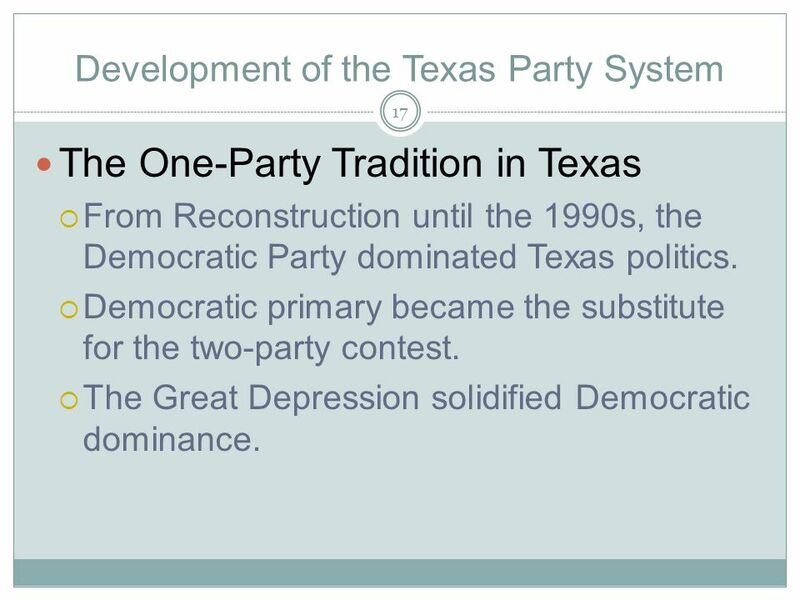 The One-Party Tradition in Texas From Reconstruction until the 1990s, the Democratic Party dominated Texas politics. 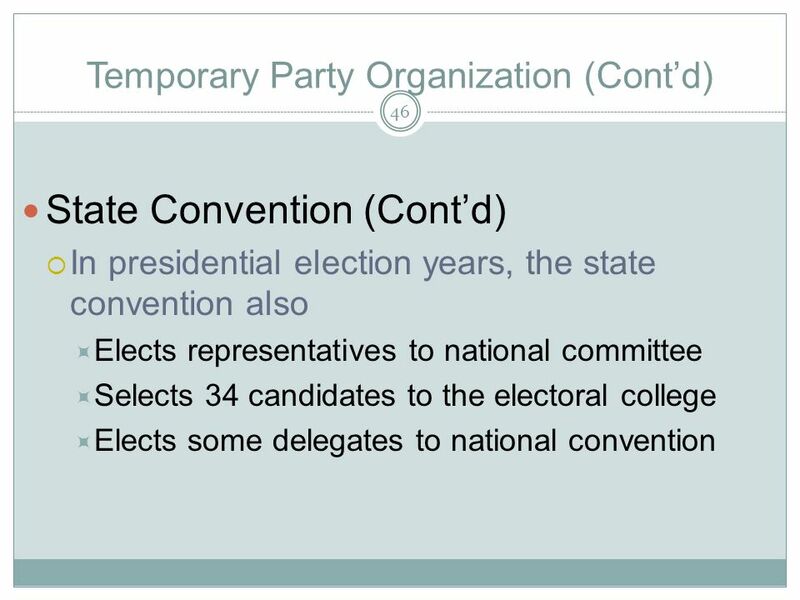 Democratic primary became the substitute for the two-party contest. 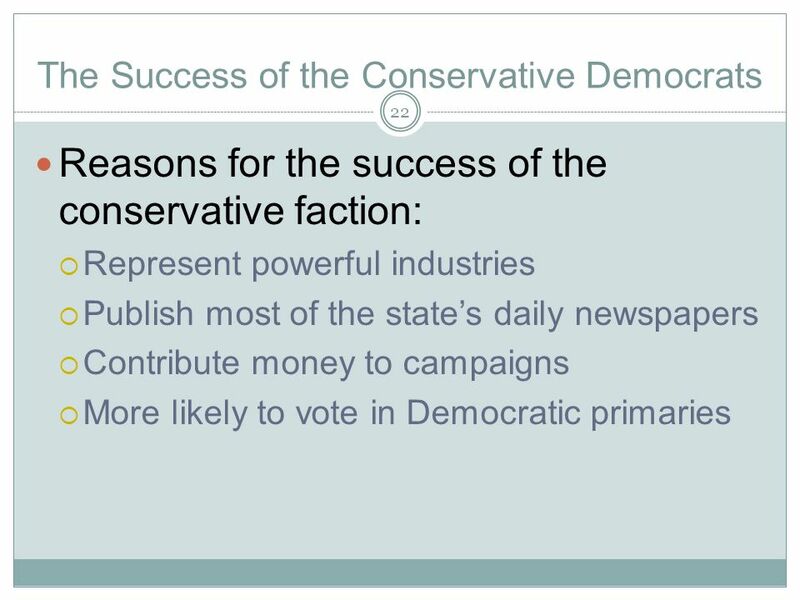 The Great Depression solidified Democratic dominance. 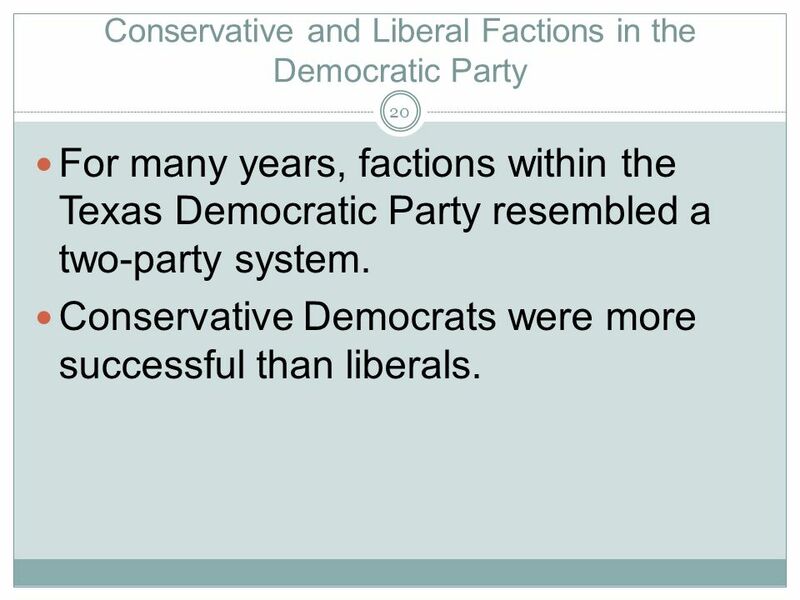 For many years, factions within the Texas Democratic Party resembled a two-party system. 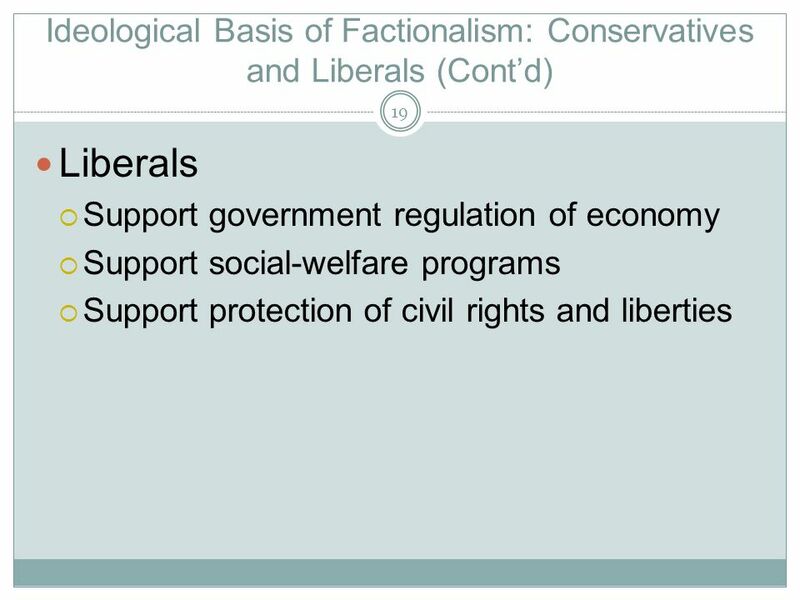 Conservative Democrats were more successful than liberals. 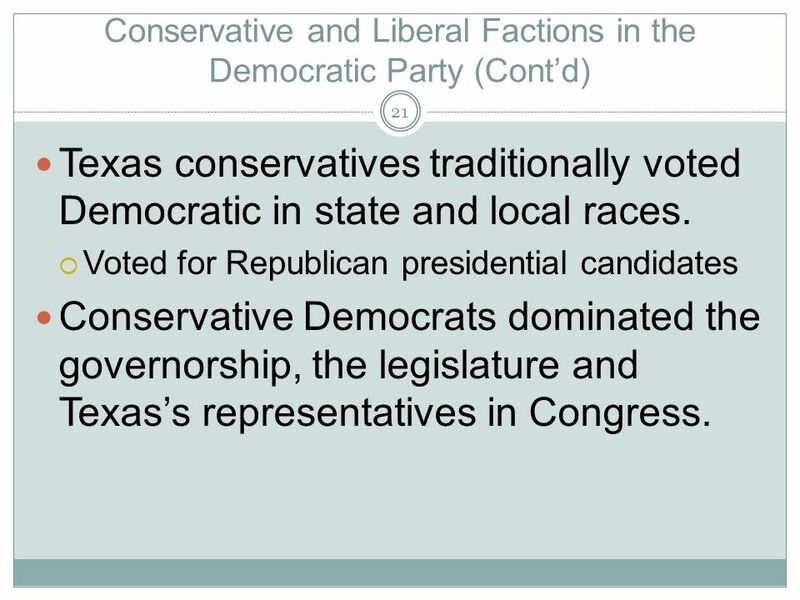 Texas conservatives traditionally voted Democratic in state and local races. 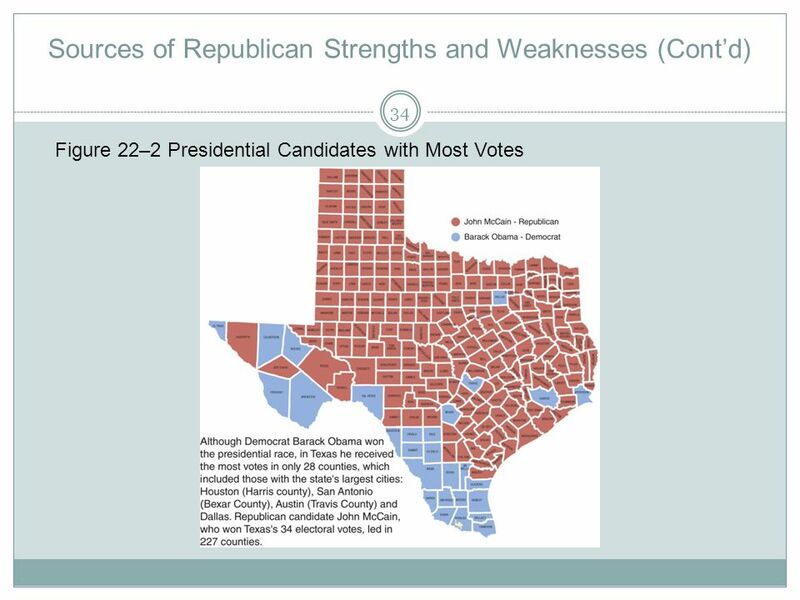 Voted for Republican presidential candidates Conservative Democrats dominated the governorship, the legislature and Texas’s representatives in Congress. 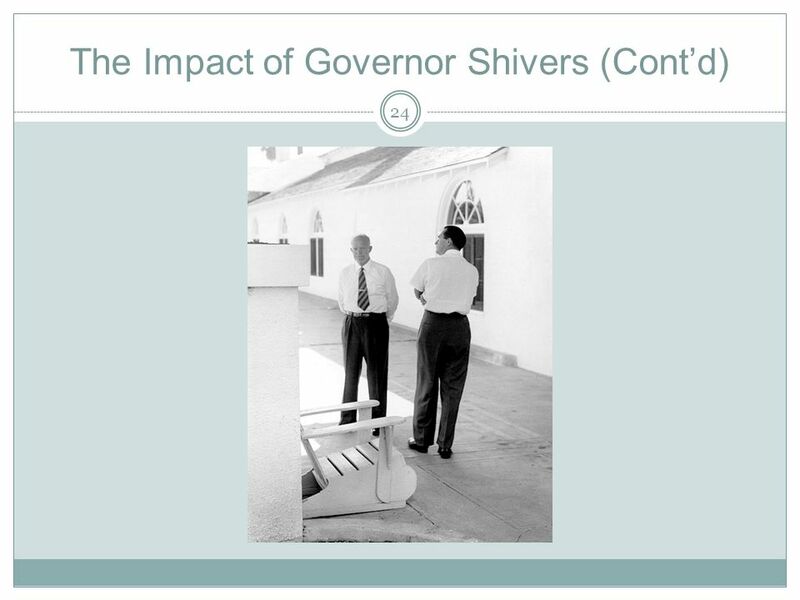 Shivers helped establish the dominance of the conservative faction of the Democratic Party. 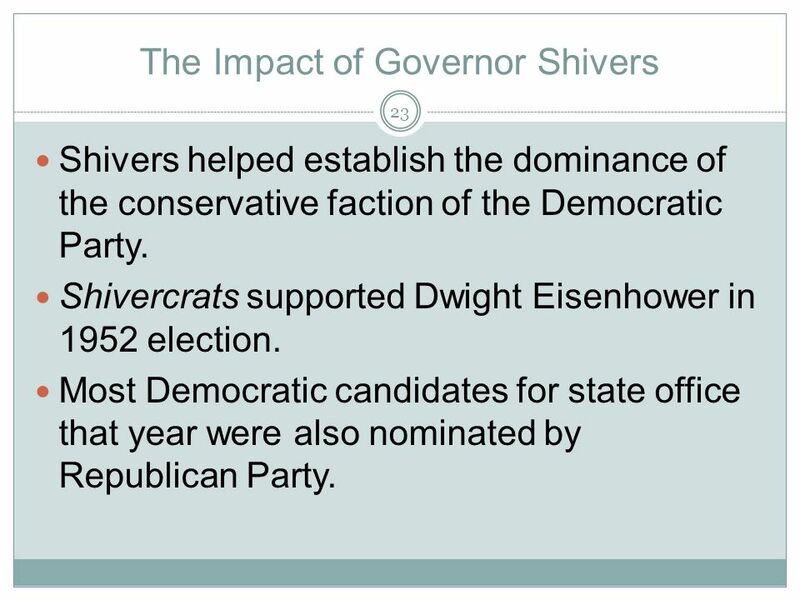 Shivercrats supported Dwight Eisenhower in 1952 election. 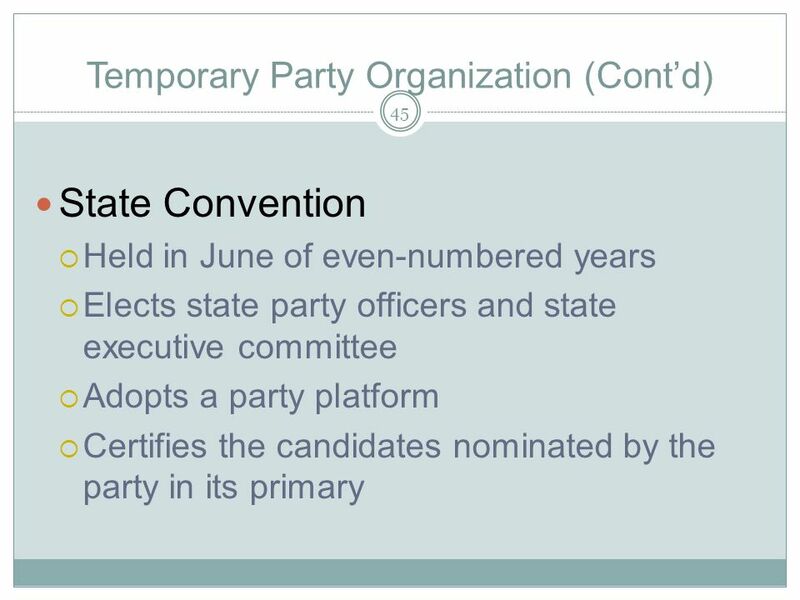 Most Democratic candidates for state office that year were also nominated by Republican Party. 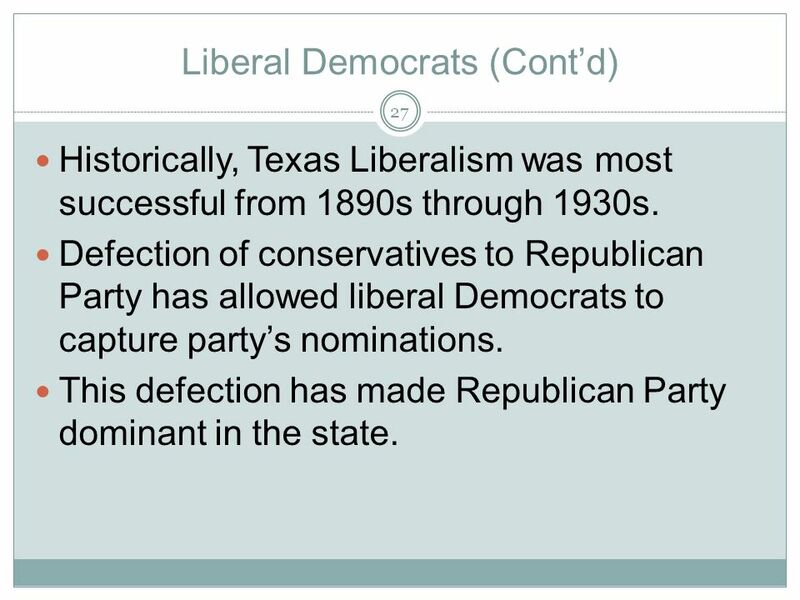 Historically, Texas Liberalism was most successful from 1890s through 1930s. 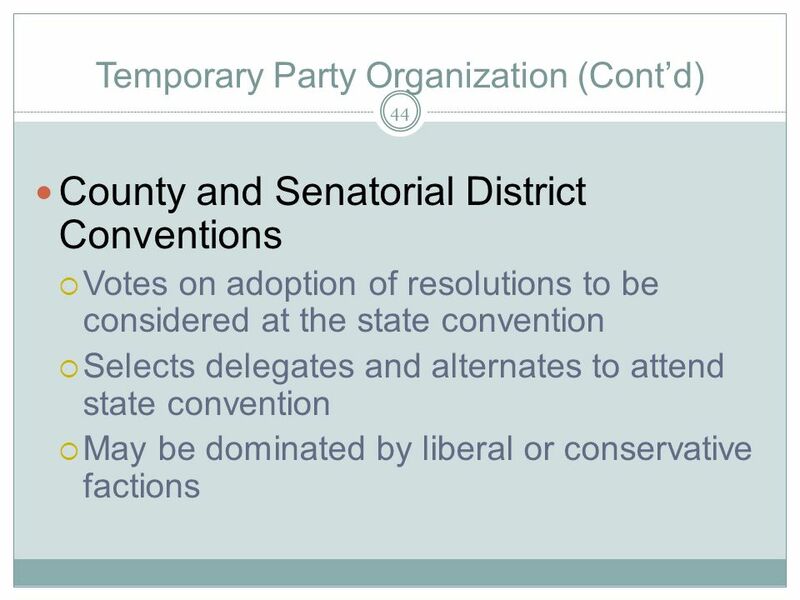 Defection of conservatives to Republican Party has allowed liberal Democrats to capture party’s nominations. 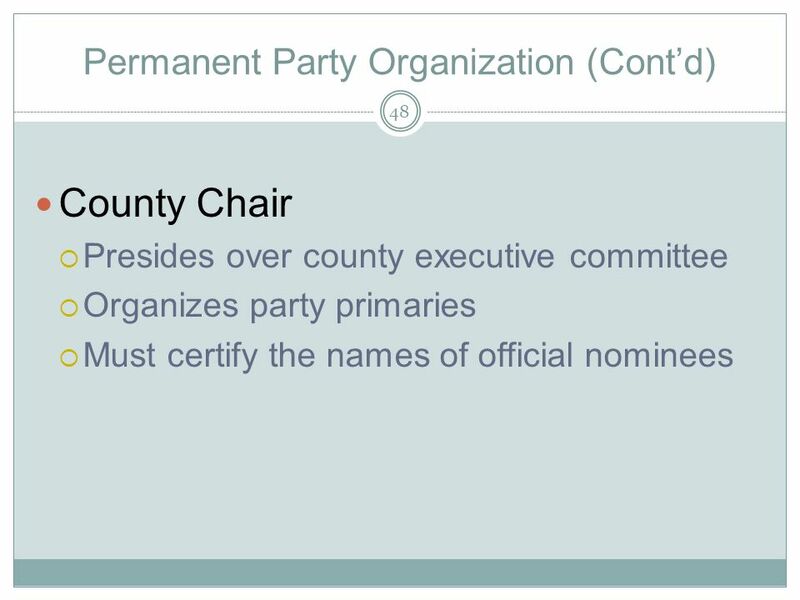 This defection has made Republican Party dominant in the state. 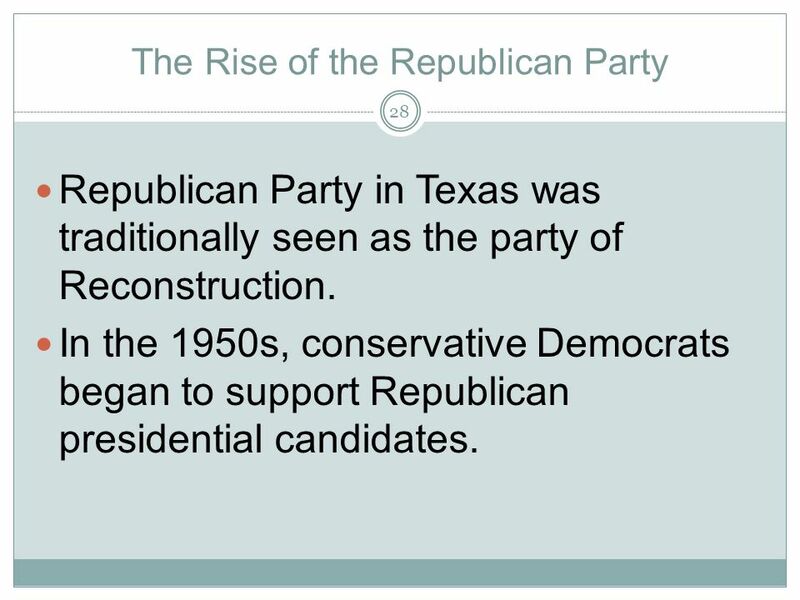 Republican Party in Texas was traditionally seen as the party of Reconstruction. 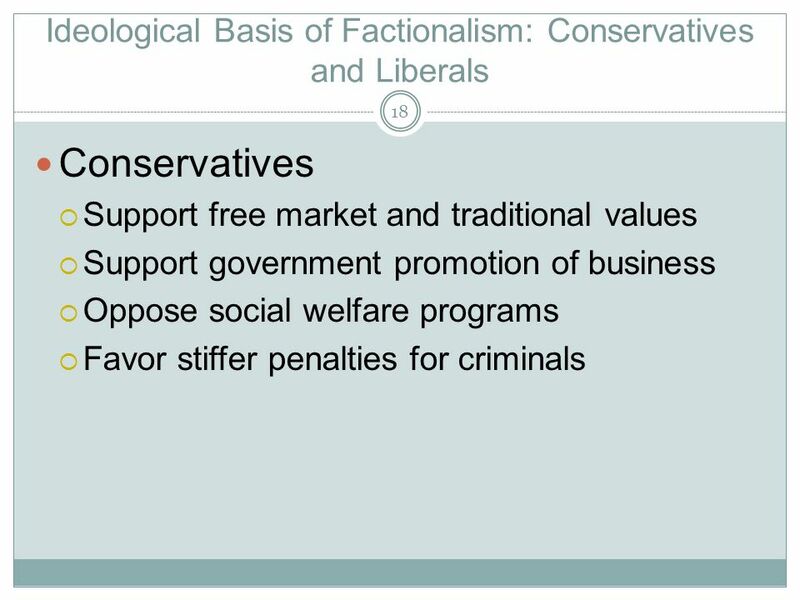 In the 1950s, conservative Democrats began to support Republican presidential candidates. 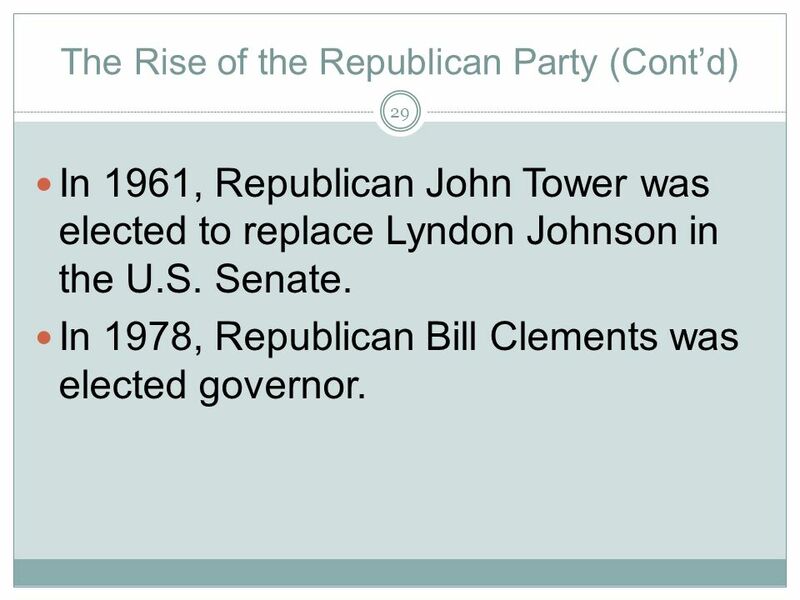 In 1961, Republican John Tower was elected to replace Lyndon Johnson in the U.S. Senate. In 1978, Republican Bill Clements was elected governor. The party has failed to generate much support among the minority voters. 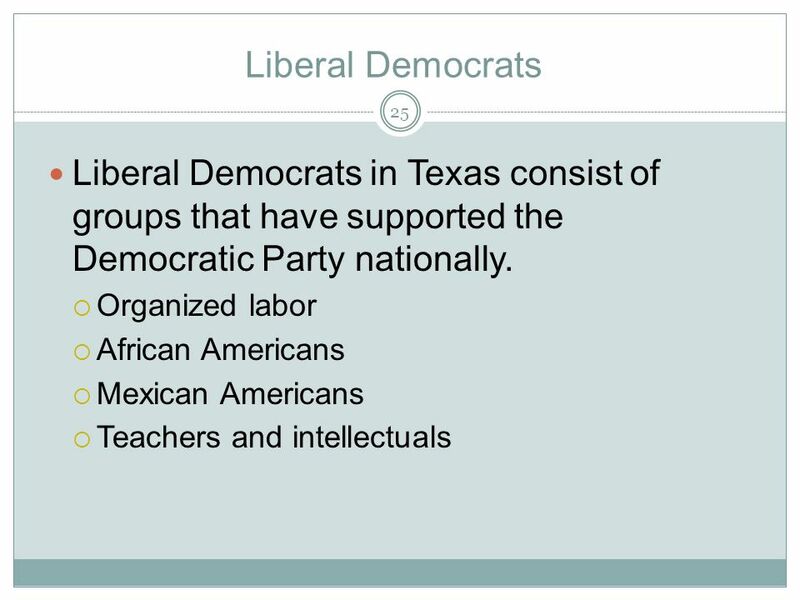 Mexican Americans have traditionally identified with the Democratic Party. 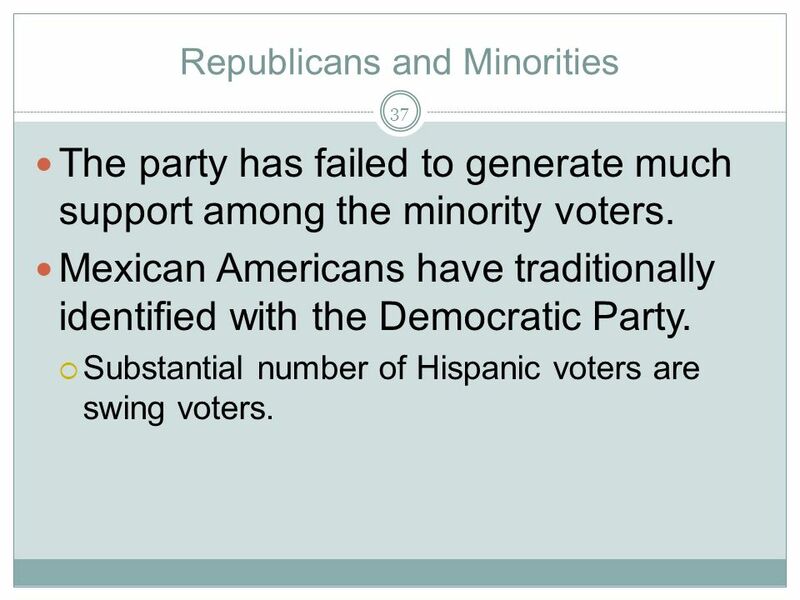 Substantial number of Hispanic voters are swing voters. 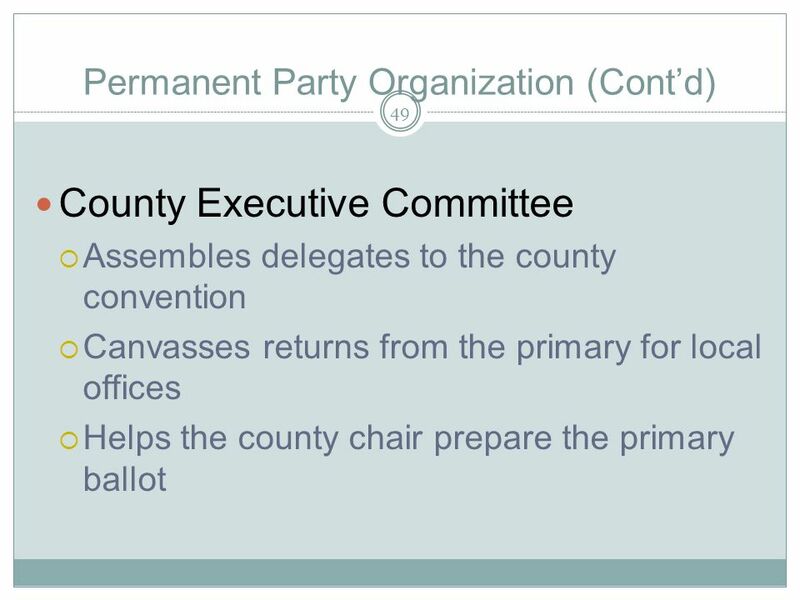 Precinct Convention (Cont’d) Open to all who vote in the primary election Attendance is very low. 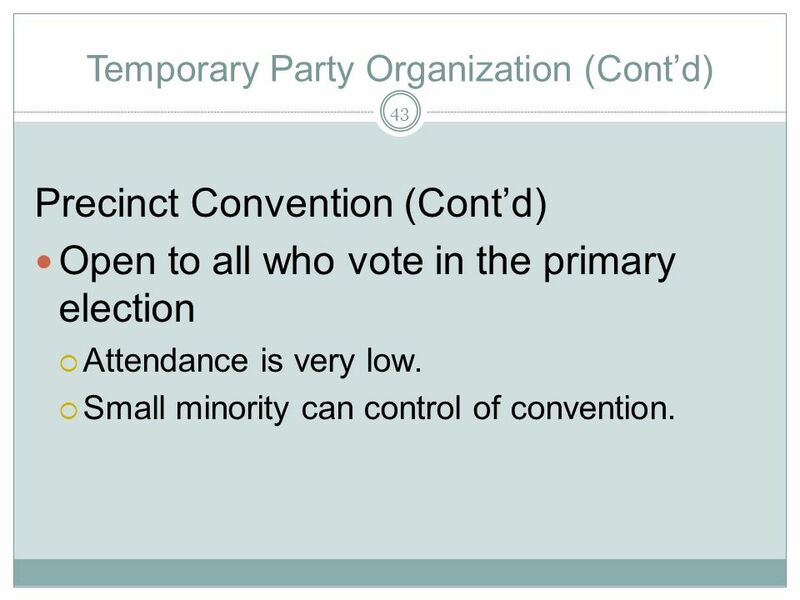 Small minority can control of convention. 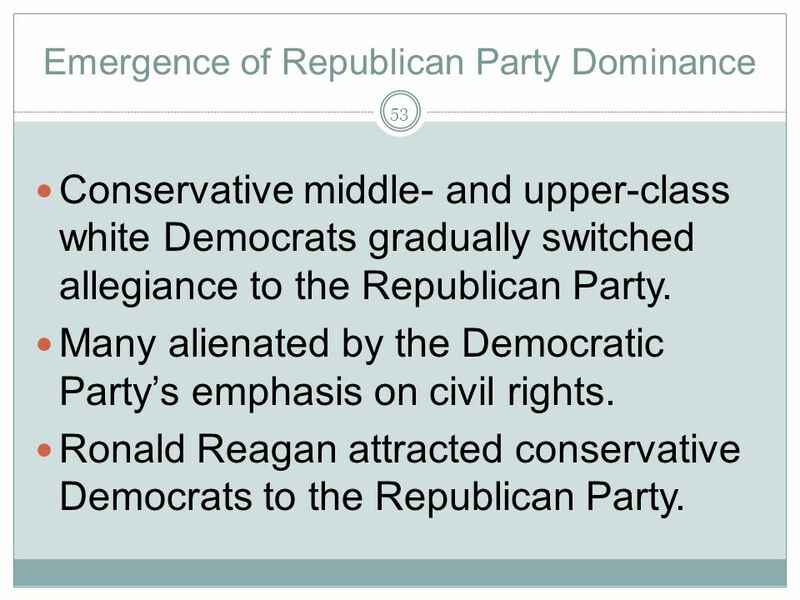 Conservative middle- and upper-class white Democrats gradually switched allegiance to the Republican Party. 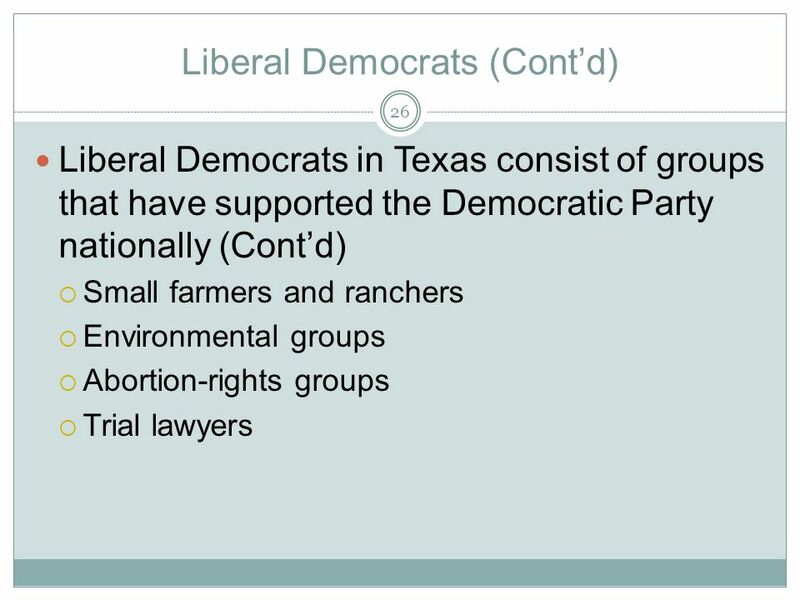 Many alienated by the Democratic Party’s emphasis on civil rights. 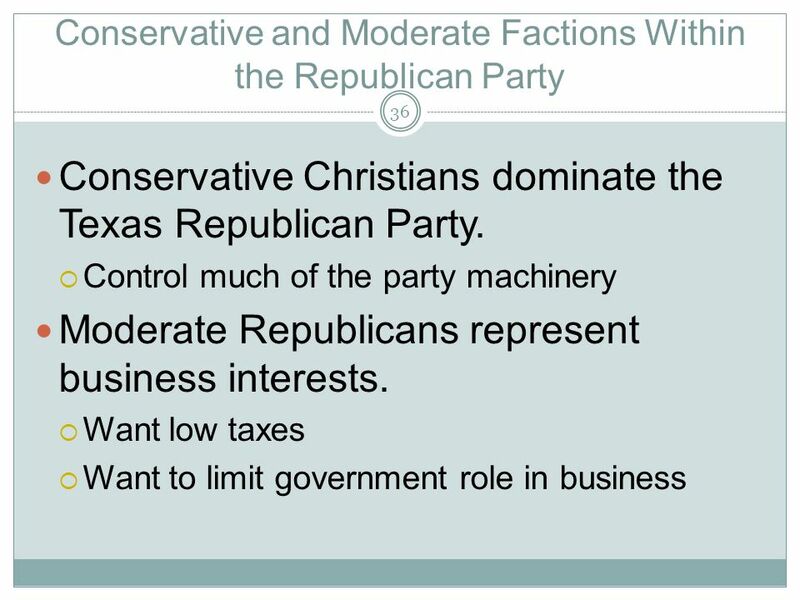 Ronald Reagan attracted conservative Democrats to the Republican Party. 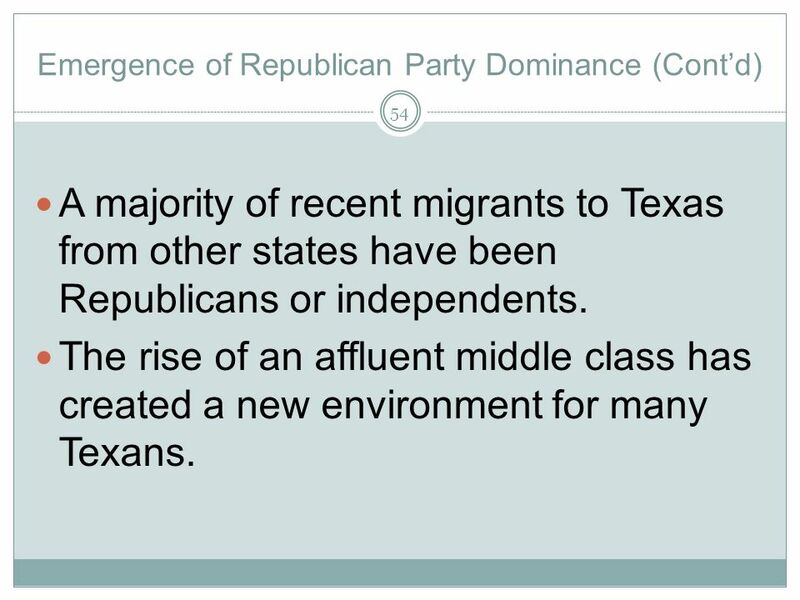 A majority of recent migrants to Texas from other states have been Republicans or independents. 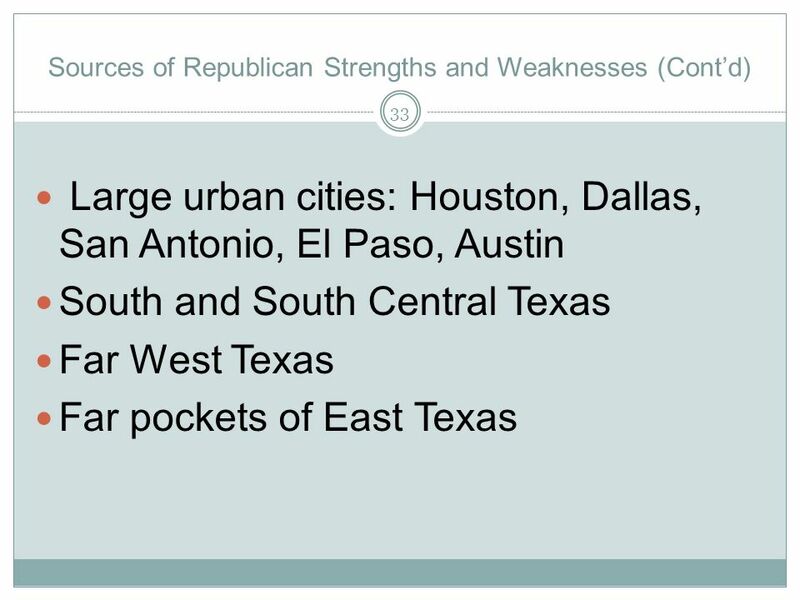 The rise of an affluent middle class has created a new environment for many Texans. 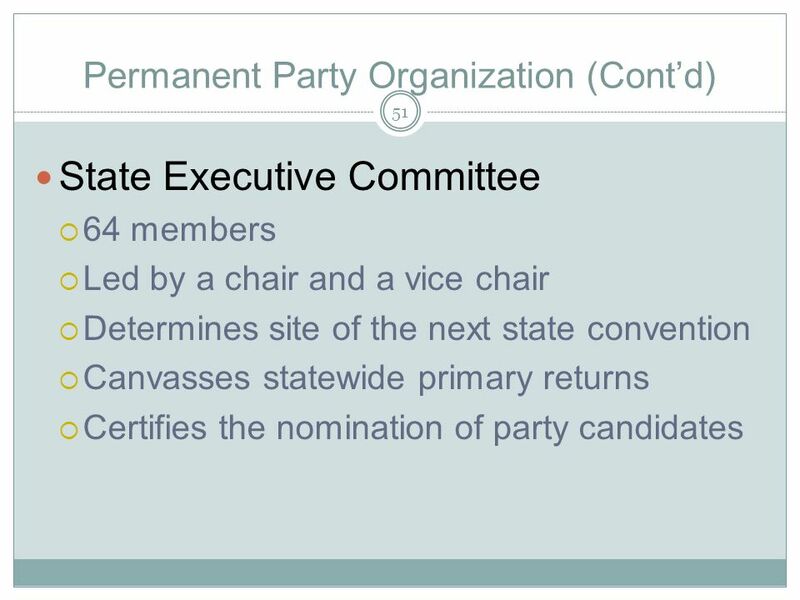 56 Can the Democrats Still Be Competitive? 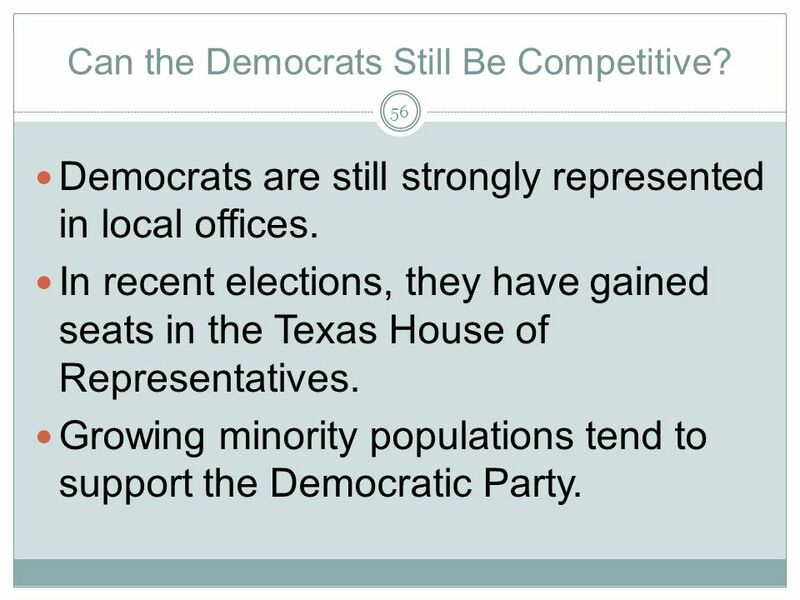 Democrats are still strongly represented in local offices. 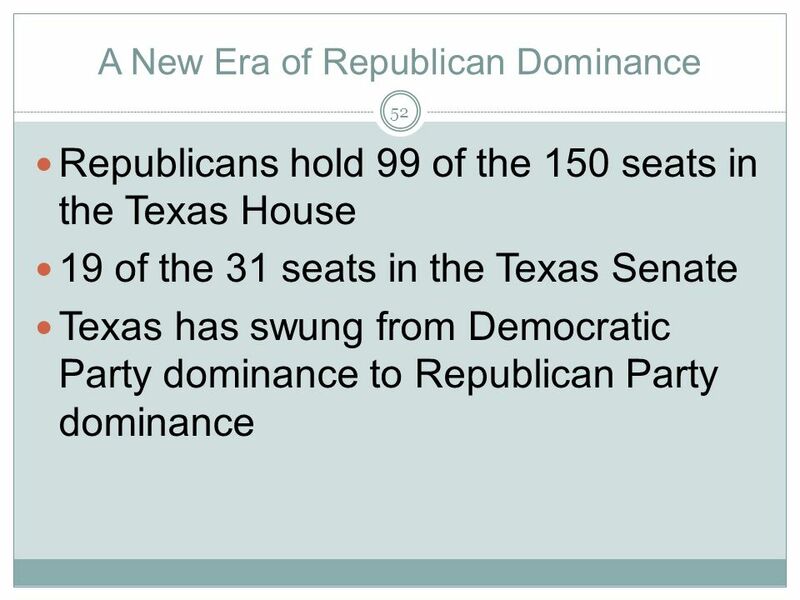 In recent elections, they have gained seats in the Texas House of Representatives. 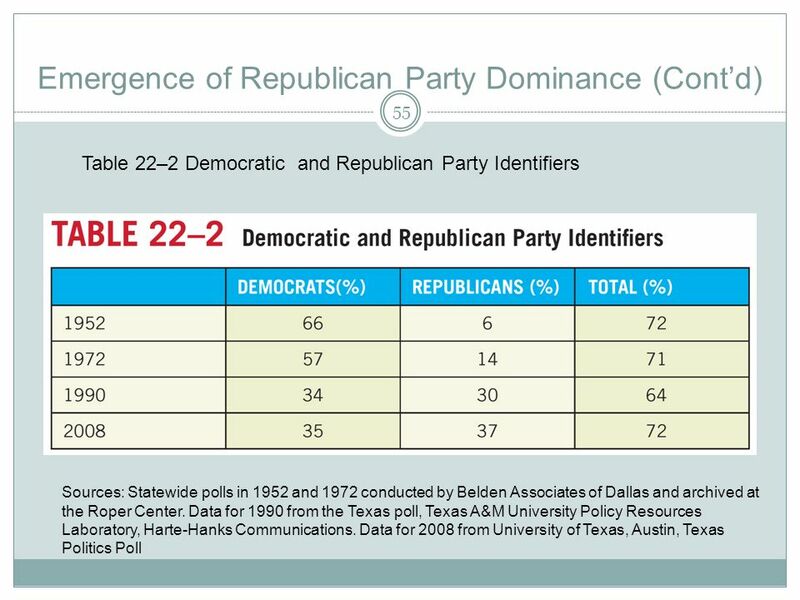 Growing minority populations tend to support the Democratic Party. 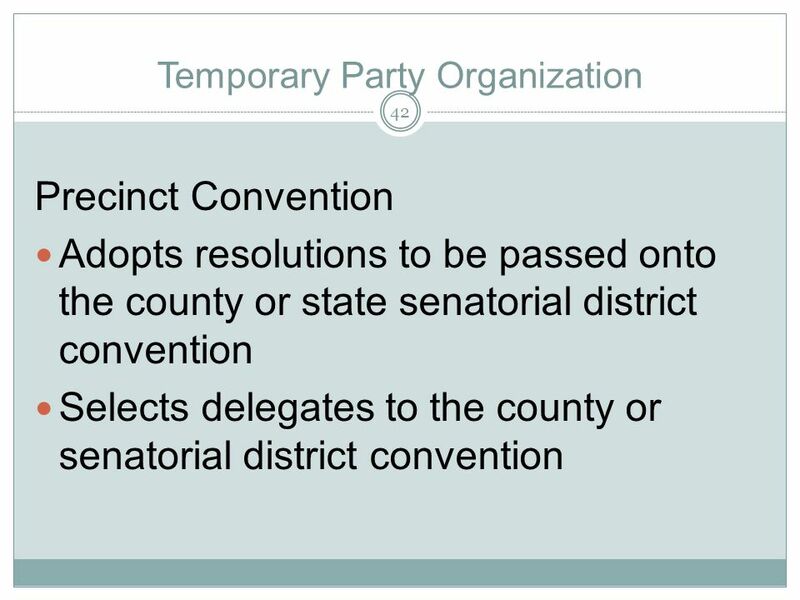 57 A growing number of voters in Texas engage in ticket splitting. 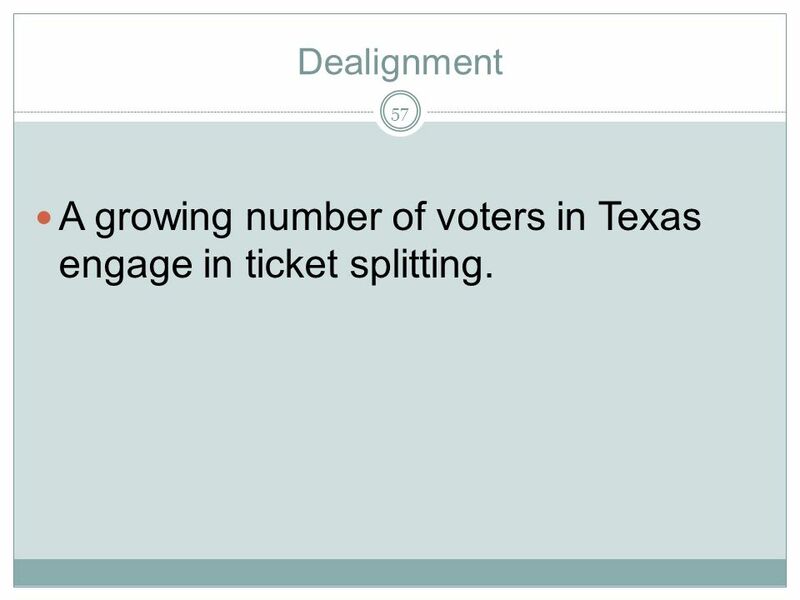 Dealignment A growing number of voters in Texas engage in ticket splitting. 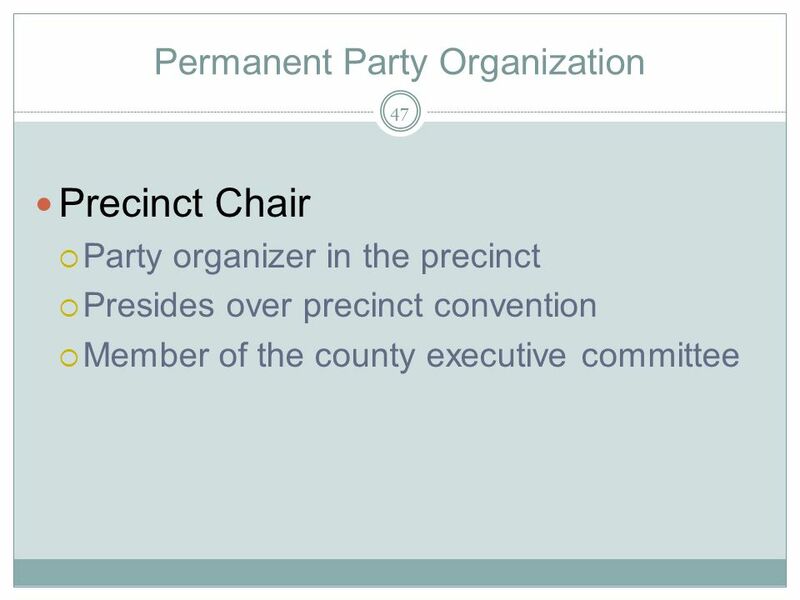 Many politicians got started at the precinct level. 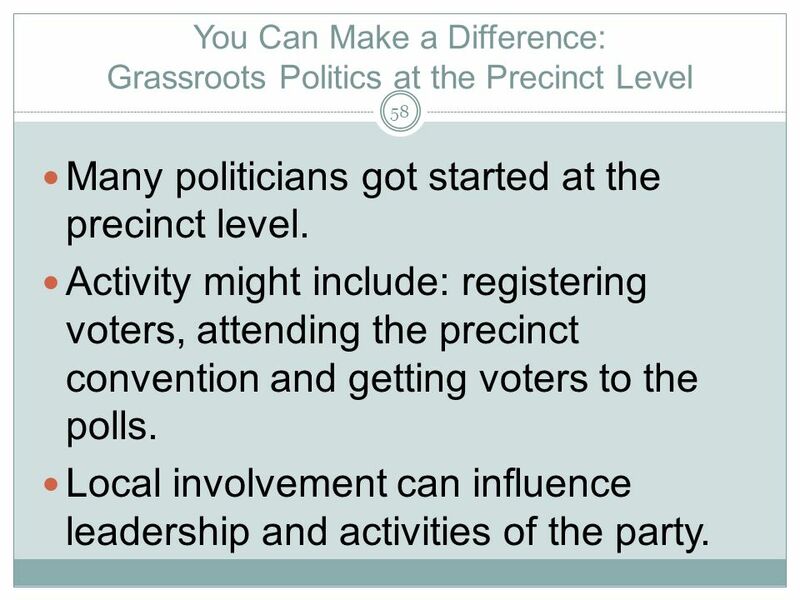 Activity might include: registering voters, attending the precinct convention and getting voters to the polls. 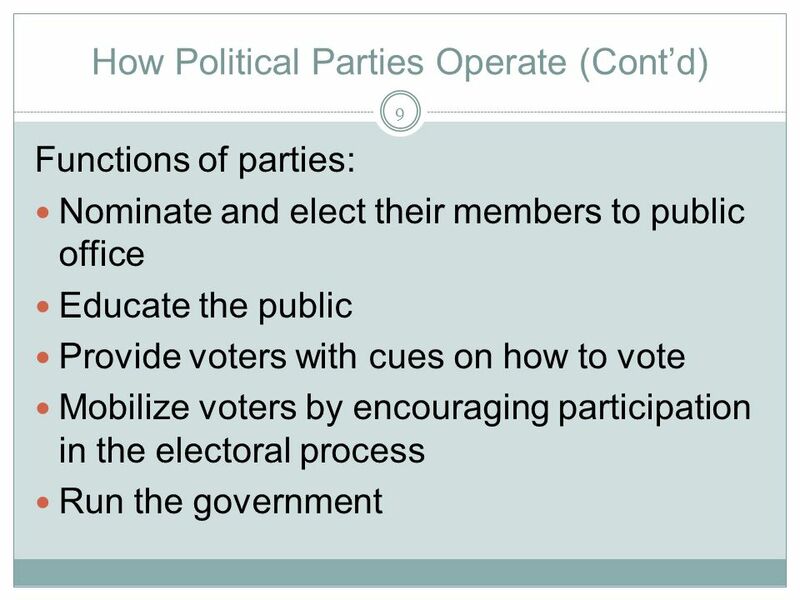 Local involvement can influence leadership and activities of the party. What Can You Do? 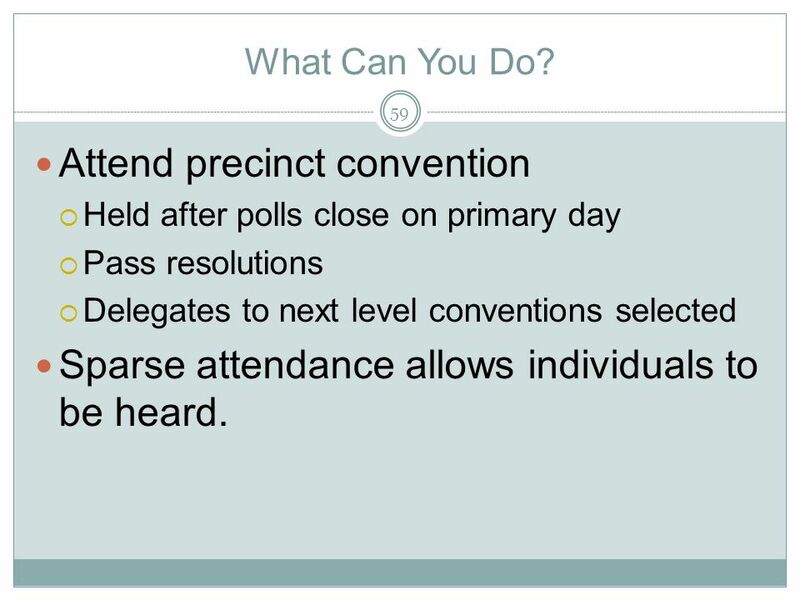 Attend precinct convention Held after polls close on primary day Pass resolutions Delegates to next level conventions selected Sparse attendance allows individuals to be heard. 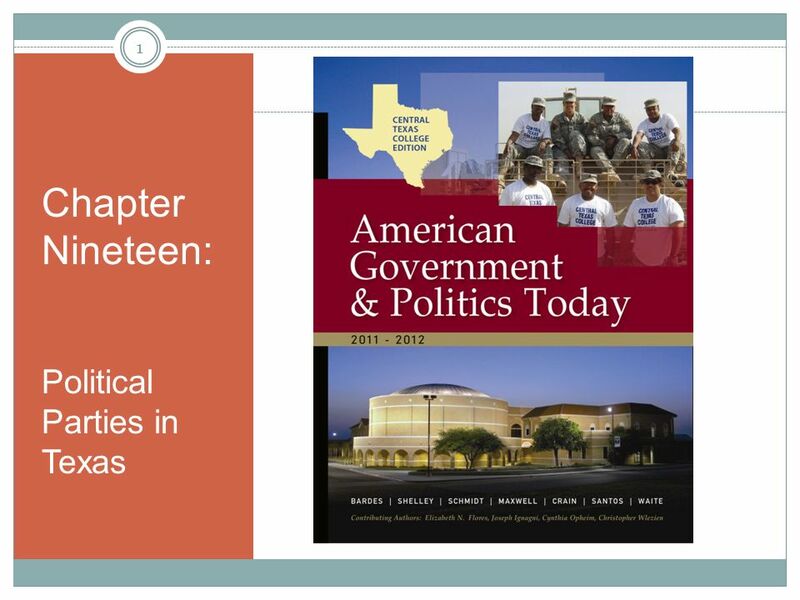 Download ppt "Chapter Nineteen: Political Parties in Texas." Hispanic America 2002 New Orleans April 26, 2002. Media-Monitoring Final Report April - May 2010 News. Table 12.1: Cash Flows to a Cash and Carry Trading Strategy.